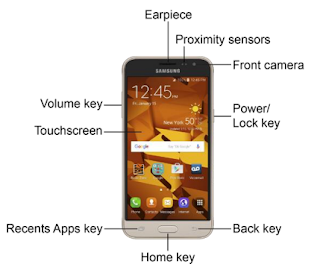 The Samsung Galaxy J3 user manual provide many reference information such as phone layout, Parts and Functions, Turn Your Phone On and Of, Use the Touchscreen, Phone Settings Menu on page 16, using Samsung Keyboard, Lock and Unlock Screen on page 44, Update Phone Software on page 46, Customize the Home Screen on page 58, Change the Wallpaper, Voicemail Setup, Configure Visual Voicemail Settings on page 80, Phone Settings on page 87, Import and backup Contacts. Then about using Gmail, Set Up an Email Account, Exchange ActiveSync Email Features, using browser, using camera and video, tutorial record video, Camera Options and Settings and using apps like 1Weather, Gadget Guardian, Google maps, Microsoft excel, microsoft onenote, power point, microsoft word, NextRadio, Samsung Milk Music, and more. 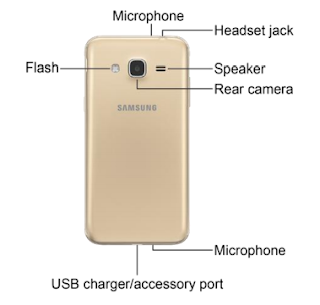 Other important information in the Samsung Galaxy J3 user guide also discuss about using wi-fi, using bluetooth, VPN settings, printing guide, Backup and Reset, Factory Data Reset, Install a microSD Card and more.